Dirt can cause the ball to roll off line when putting. Hitting a golf ball into a pond does not mean the ball is lost forever. With the right tool, you can retrieve most golf balls hit into a pond. 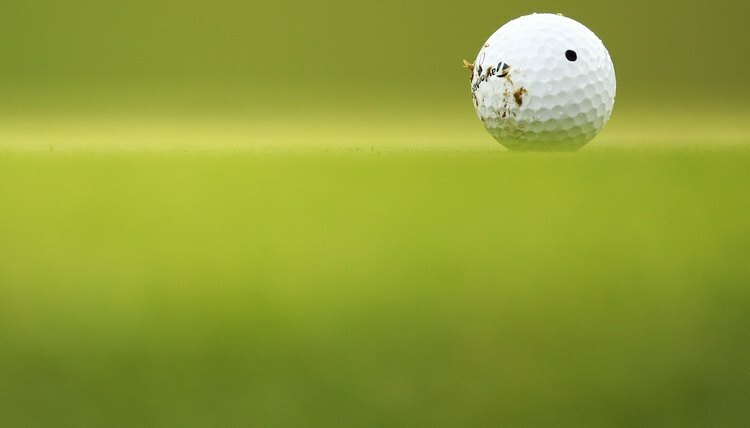 Golf balls that have been in a pond for a long time are likely to feel grimy and look dirty, so golf-ball hunters should clean them before using them or trying to sell them. Follow these steps to clean golf balls found in a pond. Begin by purchasing and using a golf ball retriever to fish golf balls from the pond. There are many different types of retrievers, and they're available wherever golf equipment is sold. Rinse the golf balls. You can use either an outdoor hose or the hose in your sink to remove grime. Fill your sink with hot water and add a cup of liquid dish soap. Dump the golf balls into the water. Let them soak for about two hours. Take the golf balls out of the water. Dip the toothbrush into a new solution of soap and water. Scrub the golf balls with the toothbrush in order to remove residual dirt. Rinse the soap from the golf balls and wipe them with a dry, clean towel.